When we think about someone being emotionally immature, most of us probably think about how young children may fit into such a category. But what if the person who is emotionally immature is the parent? How is a child or teenager affected by a parent who cannot provide the intimacy and the emotional connection they need? How does this behavior translate to being an adult, but simultaneously a child of a parent who is emotionally immature? How can these now adult children learn how to have meaningful and emotional relationships that are not based upon or similar to that of their emotionally immature parent? In Adult Children of Emotionally Immature Parents: How to Heal from Distant, Rejecting, or Self-Involved Parents, Lindsay Gibson writes about the impact that emotionally immature parents have on their children, the ways in which children are affected, and how they often grow up with feelings of loneliness while simultaneously expressing that they have a difficult time functioning in relationships. At the same time, Gibson states that it is possible for those adult children to break free from the constraints of their emotionally immature parents in order to build a better life for themselves. Gibson points out that it is important to recognize the characteristics of an emotionally immature parent, their personality pattern. Gibson lists many characteristics, such as being rigid and single-minded, to being subjective, having little respect for differences and focusing strongly on the physical, not the emotional. Some emotionally immature parents may not display all these categories, but Gibson states that if they display one or more, chances are that either both or one of your parents may be emotionally immature. Gibson also states that it is incredibly difficult, if not sometimes impossible to communicate with an emotionally immature parent, since they often provoke anger, they do not engage in much emotional work, and because the parent feels entitled due to the roles that you are in. But not all emotionally immature parents are the same. Gibson describes four types; the emotional parent, the driven parents, the passive parent and the rejecting parent. Children react in different ways to their emotionally immature parent, but Gibson states that two styles of coping are more common, the internalizer and the externalizer. Gibson says that the kind of person more likely to read the book is the internalizer, so she spends a chapter discussing characteristics of the internalizer. From chapter seven and forward, Gibson focuses on discussing and explaining how it feels to simultaneously break down, and wake up with anger and frustration towards one or both parents. Gibson also writes about how to avoid getting hooked by an emotionally immature parent, and what the child needs to do in order to distance themselves from situations that can be frustrating and damaging. Perhaps most important, Gibson acknowledges the fact that using detached observation is the best way to deal with an emotionally immature parent in order to get a grip on ones own feelings. Gibson also describes what it feels like for a person to live free from the burden of an emotionally immature parent and how to (since relationships are often affected) identify people who are emotionally mature and enjoyable to be around. Adult Children of Emotionally Immature Parents is a really fascinating book that speaks to a wide audience. If you do not have an emotionally immature parent of your own, chances are that you can think of someone else in your surrounding that is either emotionally immature, or someone that is dealing with a parents that is (no matter their age). 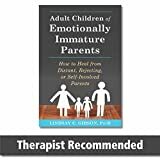 The book is easy to read and gives plenty of examples of emotionally immature parents and the ways in which they think and act. Trying to relate to or even deal with an emotionally immature parent can be incredibly frustrating, so Gibson has given the reader a way in which he or she can work on letting go of the frustration and anger, and a way to move forward despite feelings of loneliness and hurt.